Looking for ideas as to how to lay out your woodshop? Maybe how they store unused wood stock, or how they position their woodworking machines? This photo gallery of woodshops may help give you some ideas for how to lay out your woodworking workshop. If you'd like to add a photo of your shop to the woodshop gallery, we invite you to submit your photo and description to the Woodworking Guide. Miguel Zamora sent in this picture of his workshop and recent table project at the Cerro Chato Eco Lodge in the Arenal Volcano Area of La Fortuna de San Carlos, Costa Rica. This woodshop photo is the outdoor Florida woodshop of Woodworking Guide Chris Baylor. This woodshop photo shows a portable miter saw stand, temporary shop table consisting of a pair of sawhorses with plywood as a table top, a contractor table saw and band saw on portable bases, and an Adirondack loveseat glider rocker that is a current woodworking project in progress. Living in South Florida gives me the ability to work under the bright Florida sun by simply rolling the woodworking power tools out from under the roof. On days like the one when this photo was taken, when rain is expected later in the afternoon, most of the tools can be kept under the roof, and rolled away into large lockable storage rooms in less than five minutes. Photo Gallery: Inside Woodshops Chris Baylor's Old Woodshop. (c) 2004 Chris Baylor licensed to About.com, Inc.
Gediminas took this photo of this sculpture as he's working outside in his woodshop, the great outdoors. Beautiful wood carving indeed. Gediminas Jecys provided this photo of his wood sculpture workshop. Note the intricate carvings on the doors. Unhindered By Talent took this photo of a craftsman at work in his woodshop in Toledo, Spain. Notice the wood turning that the woodoworker is producing on his lathe. TheKitchenDesigner.org posted this photo of a commercial cabinetry woodshop. Notice the dust collection ductwork and lumber storage racks in this woodshop. Sfllaw took this photo of a woodshop in Parc-Extension, Montreal, Quebec. Hopefully this was a bad day in the woodshop, as it's quite a mess. This would be a good example of how a woodshop should not look under normal conditions, as such clutter would be quite unsafe when using woodworking power tools. Shekay shot this interesting photo of a woodworker building a cane in her small woodshop. Note the portable table saw and drill press in the woodshop background. Tvol took this photo of the sculpture woodshop at the University of Michigan. Note the power tools on the left wall and the wood vise on each woodshop table in the foreground. AntwerpenR shot this interesting photo of a wood shop in Bangkok, Thailand. As he notes, it seems that every street in Bangkok has a specialty. He shot this photo on a street where woodshops are common. Jeff (OK-59) posted this photo of his woodshop, showing his band saw with an arch table and booth backstop that he was in the process of building. Woodworker mtneer_man posted this photo of his woodshop showing the west wall of tools and parts storage. Notice the homemade roller table, overhead air lines and table saw with outfeed table. KCKellner posted this image of a pair of woodworkers building a ramp for her dog, Melo. The wooden ramp was designed to help the dog get up and down off of her couch. Photo Gallery: Inside Woodshops Steve Ryan's Photo of Miter Saw in Woodshop. Steve Ryan took this photo of his woodshop and his new miter saw stand with his Bosch compound miter saw installed. Notice the locking lift-caster on the right side of the stand so Steve can move the stand around his woodshop. MShades shot this interesting photo of a woodshop on Senbon Street in Kyoto, Japan. Notice the portable shop tables and the thickness of the wood stock on display outside of the woodshop. Show off your woodworking work space! How to Add Your Woodshop Photo to the Gallery. (c) 2009 Chris Baylor licensed to About.com, Inc.
Would you like to show off your woodshop? 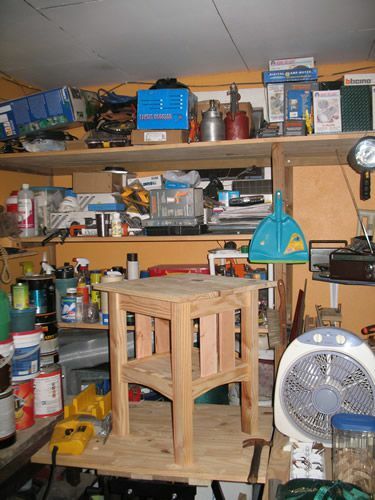 Send a photo and description to the Woodworking Guide to add your woodworking work space to the woodshop photo gallery.